At last, Egypt is now free from the oppressive rule of the Muslim Brotherhood! The Armed Forces took the side of the millions of Egyptians who demonstrated in the streets since the 30th of June against President Mursi and the Muslim Brotherhood. The Armed Forces responded to the invitation of the people to intervene and force the President to step down at the request of the people of Egypt. Field Marshall Abdel Fattah el-SiSi invited His Holiness Pope Tawadros II and The Grand Imam of Egypt Dr. Ahmed el-Tayyib, and other politi-cal leaders, to discuss the roadmap for the future of Egypt. After this meeting, it was announced that the head of the constitutional court will be an interim leader of the nation. The current controversial constitu-tion is now suspended. The new government will involve capable people from different backgrounds. As soon as Field Marshall Abdel Fattah el-Sisi an-nounced this, millions of Egyptians on the streets went around rejoicing, singing, dancing, and making a lot of fireworks. I have never seen Egyp-tians rejoicing in such a way! They deserve this joy as they insisted to write their own history! Since the Muslim Brotherhood ruled the country a year ago, we Egyptians experienced divisions, exclusions, sectarian clashes, fanaticism, a decrease in tourism, and a bad economy. 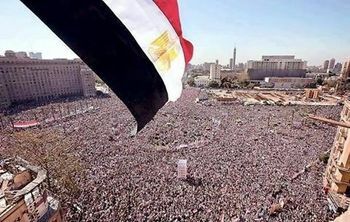 This is an answer to the prayers of so many people from around the world who were praying for our beloved country Egypt. Please continue to pray for protection from violent reaction of the Islamists which already has started. Pray also for unity and reconciliation after more than 1 year of divisions.